In a new paper in Nature Geoscience, John Marshall explains how an updated circulation model reveals the Southern Ocean as a powerful influence on climate change. 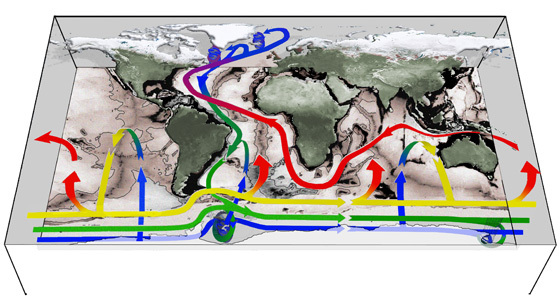 A new schematic emphasizes the role of the Southern Ocean in the world’s ocean circulation. The upper regions of ocean circulation are fed predominantly by broad upwelling across surfaces at mid-depth over the main ocean basins (rising blue-green-yellow arrows). Upwelling to the ocean surface occurs mainly around Antarctica in the Southern Ocean (rising yellow-red arrows) with wind and eddies playing a central role. John Marshall is an oceanographer interested in climate and the general circulation of the atmosphere and oceans, which he studies through the development of mathematical and numerical models of key physical and biogeochemical processes. 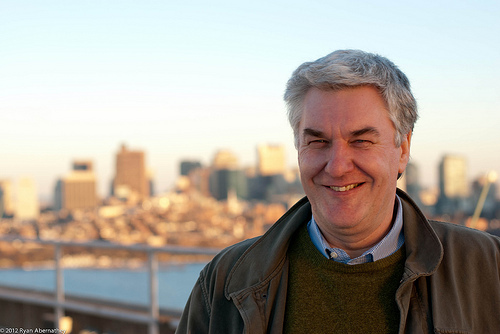 His research has focused on important, and usually difficult, problems of ocean circulation involving interactions between motions on different scales, using theory, laboratory experiments, observations and new innovative approaches to global ocean modeling pioneered by his group at MIT. Current research interests include: ocean convection and subduction, stirring and mixing in the ocean, eddy dynamics and the Antarctic Circumpolar Current, the role of the ocean in climate, climate dynamics, aquaplanets.